History of Federal | Federal Lodge No. 1, F.A.A.M. of Washington D.C.
Federal Lodge No. 1, of the District of Columbia was chartered September 12, 1793, by the Grand Lodge of Maryland, as Federal Lodge #15. The brethren who secured the charter were employed in the construction of the Capitol Building and desired to be present Masonically with their own Lodge at the ceremonies incident to the laying of the cornerstone on September 18, 1793. Brother Clot Worthy Stephenson, as representative of the nine brethren, journeyed to the Grand Lodge of Maryland which met at Easton, Maryland, on September 12, 1793, with a petition to form a Lodge in the nation’s capital. A charter was issued designating James M. Hoban, Worshipful Master; Clot Worthy Stephenson, Senior Warden; and Andrew Eastave, Junior Warden. The first meeting was held on Sunday, September 15, 1793, in a dwelling of one of the members south of the Capitol grounds on the site of the present U.S. House of Representatives Offices Buildings. 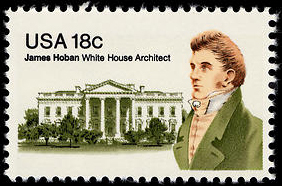 The first Master, Captain James M. Hoban, a native of Ireland, came to the District of Columbia in June of 1792 from Charleston, South Carolina, at the request of President George Washington, to design and construct the Executive Mansion. The construction of the Capitol was soon afterwards transferred to his charge. On October 13, 1792 James Hoban, architect and Collen Williamson, Master Mason, with members of Lodge No.9 of George town, were present at the laying of the cornerstone of the White House and their names appear on a brass plaid laid under the stone. The first public appearance of Federal Lodge was Wednesday, September 18, 1793, at the laying of the cornerstone of the United States Capitol. On that historic date Brother Joseph T. Clark of Annapolis, MD; Right Worshipful Grand Master, pro tem of MD; Worshipful Master James M. Hoban and members of Federal Lodge #15, received President Washington, Officers and Members of Lodge #9 of Georgetown and retired to a temporary lodge room prepared by Worshipful Master Hoban, where Right Worshipful Brother Clark, Grand Master pro tem, opened the Grand Lodge of Maryland, and from thence, proceeded in parade formation to the site of the Capitol Building and laid the original cornerstone. Brother Clot Worthy Stephenson, first Senior Warden of Federal Lodge, was the Grand Marshal of that parade. In December, 1794, the Lodge had 14 members whose names are entered on the Grand Lodge records for perpetuation. 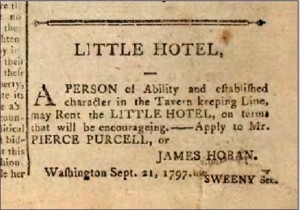 The Lodge moved from Capitol Hill to “the little hotel” on the north side of F St. NW above 14th street in 1796. In 1798, Alexander McCormick subsequently one of the great lights of local Freemasonry, became Master of the Lodge and by strict laws and surer revenue sought to arrest its decay. In 1799 the Lodge had 16 members but Hoban and all other charter members were gone from the rolls. Upon invitation of Alexandria Lodge, Federal Lodge attended the funeral of Brother George Washington on Wednesday, December 18, 1799. Brother Alexander McCormick, then Worshipful Master of Federal Lodge, was one of the bearers of the “lesser lights” and the unconsumed portion of the candle he carried was inscribed and preserved by him and is now in the possession of the Grand Lodge of the District of Columbia. The Great Light used by the Lodge at this funeral is still in possession of Federal Lodge. Its historic value was greatly enhanced when it was used at the formation of the Grand Lodge of the District of Columbia. Under the leadership of Past Master McCormick and Brother Charles Glover, Secretary of Federal Lodge, the Grand Lodge of the District of Columbia was formed. These brethren arranged for a convention to be held on December 11, 1810, of the six Lodges in what was then the District of Columbia. (Federal, Columbia, Naval Lodge of Washington, Potomac Lodge of Georgetown, Brooke-Lodge and Alexandria-Washington Lodge of Alexandria) All of the lodges were represented except Alexandria-Washington Lodge in which a majority had voted to adhere to the Grand Lodge of Virginia. The minutes of Federal Lodge contain a letter from Alexandria-Washington Lodge setting forth the reasons they did not wish to participate in the formation of the new Grand Lodge. The organization of the Grand Lodge was completed on February 19, 1811, but Federal Lodge continued to work under its Maryland charter until the monthly meeting in May when Worshipful Master Nicholas L. Queen, declared Federal Lodge No. 15 of Maryland “closed without day” and ceremoniously instituted Federal Lodge as “number one” of the new Grand Lodge jurisdiction. The large proportion of the Freemasons among the British army and Navy officers of all grades, engaged in the capture of Washington in 1814 enabled the Grand lodge and Lodge officers to enter into fraternal relations with them during the brief occupation of the city, whereby private property and interests were respected to a degree unknown in the history of warfare. On September 19, 1826, Federal Lodge joined in “the finest Masonic procession yet seen,” from St. John’s church to the southwest corner of John Marshall Place and D St for the laying of the cornerstone of Central Masonic Hall. On January 4, 1830, Brother Andrew Jackson, President of the United States, Brother John H. Eaton, Secretary of War, and Brother William T. Barry, Postmaster General, were elected honorary members. In 1831, the lodge moved from the union lodge room to the Central, Masonic Hall. In 1848, the noted Cherokee Chief, William P. Ross, received the degrees in the Lodge and at a subsequent lodge meeting a feud among headmen of the Cherokee Nation was healed in the lodge room. On July 4, 1848, nearly 50 members of the Lodge paraded at the laying of the cornerstone of the Washington Monument. On November 9, 1848, the Lodge obtained a charter from the Grand Lodge for some members who were migrating to the new El Dorado in California. The new lodge, chartered as California Lodge No. 13, still survives at San Francisco as California Lodge No. 1. In 1849 the Lodge for the first time called off meetings during the hot weather and in 1850 regular meetings were increased from one to two a month. Federal Lodge sponsored the petition of Washington Centennial Lodge No. 14 in 1852 and the petition of Benjamin B. French No. 15 in 1853. In 1854 the Lodge moved to the new Masonic Headquarters at the southwest corner of 9th and D St NW. The fortunes of the Lodge declined as a result of the Civil War in 1861 but by 1863 the strength of the Lodge was restored by accessions from the Union Army and by brethren and applicants from the North. After the end of the Civil War the lodge moved to the new Masonic Temple at 9th and F St. NW and joined in the fitting and furnishings of the larger of the two lodge rooms. The Lodge paraded at the dedication of the Washington Monument in 1885. On September 11, 1893, at a cost of over $1,000.00 to its members, the Lodge carried on a two-day celebration of its one hundredth birthday, which yet remains one of the great events in the local history of Freemasonry. In 1898 the lodge won an elegant set of jewels for securing the greatest amount of funds for the new Temple at 13th and New York Avenue. Upon the adoption of a resolution proposed by Past Grand Master Donaldson the priceless original Lodge jewels were presented to King David Lodge No. 28 of Brookland. Upon invitations by the Grand Lodge of Virginia, on December 14, 1899 the Lodge attended the solemn commemoration at Mount Vernon of the One-Hundredth anniversary of the Masonic burial of George Washington. In 1899 Federal Lodge came into possession of $20,000 under terms of the will of Past Master Anthony Buchly who had died in 1884. Past Master Buchly who was a shrewd and kindly man also bequeathed $15,500 to the St. John’s Mite Association. The Buchly Charity fund of the Lodge now amounts to over $100,000 in principal. The income from this fund is available for charitable purposes. On Tuesday, November 12, 1901, President Theodore Roosevelt appeared in Federal Lodge to accept honorary membership in the Lodge. After cooperating for many years in collection of funds for a new Masonic Temple, Federal Lodge had its Grand Visitation in the new Masonic Temple at 13th and New York Avenue on October 13, 1908. 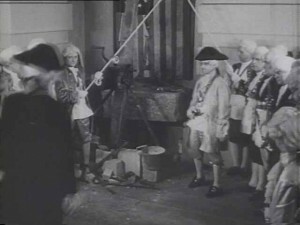 On September 17, 1932, historic Old Federal participated in the colorful Masonic parade and re-enacting of the laying of the cornerstone of the US Capitol in colonial costumes. The one-hundred and fiftieth anniversary of the Lodge was commemorated with an elaborate banquet and much ceremony on September 11th, 1947, during the year of Worshipful Master W.J. Chisolm, the Lodge honored the five Lodges which it had sponsored (California Lodge #1, Columbia No. 3, Lebanon No. 7, Washington Centennial No. 14, and Benjamin B. French No. 15) by a special meeting held at the Scottish Rite Temple. In addition to the prominent persons named before who have taken an active part in the affairs of the lodge, Daniel C. Roper, who served as Secretary of Commerce under President Franklin D. Roosevelt, affiliated with Federal Lodge. Admiral Richard Evelyn Byrd, the polar explorer, and J. Edgar Hoover, of the FBI, received their Masonic Degrees in Federal Lodge, Former Senator Capehart of Indiana, Former Senator Truman of Missouri, and Former Representative Sol Bloom of New York. 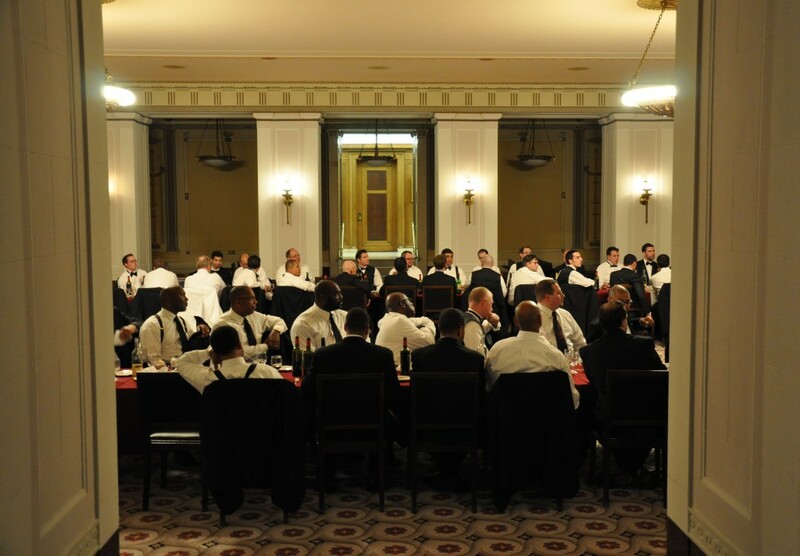 In January 2010, Federal Lodge moved locations once again, returning to downtown Washington D.C. where it currently holds its meetings. Today, the Lodge is a quickly growing and an active organization that truly plays a dynamic role in the life of DC Freemasonry.